THE MAJOR RESEARCH PROJECT OF THE U.G.C TITLED " STUDIES ON THE DIVERSITY OF ORCHID FLORA OF DARJEELING HIMALAYA " WAS CONDUCTED IN THE TAXONOMY AND ETHNOBIOLOGY RESEARCH LABORATORY CLUNY WOMENS COLLEGE, KALIMPONG FROM 2009 TO 2012 UNDER THE GUIDANCE OF DR. R.B BHUJEL, PRINCIPAL. MISS LEENA SUBBA WAS APPOINTED AS THE RESEARCH PERSONNEL. THE COMPLETION REPORT AS PER THE GUIDELINE OF THE U.G.C HAS BEEN PUBLISHED IN THIS WEBSITE. 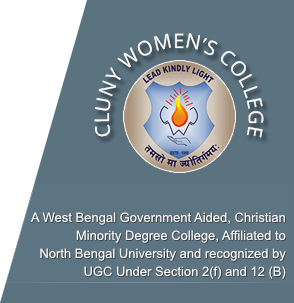 CLUNY WOMENS COLLEGE IS GRATEFULL TO THE UNIVERSITY GRANTS COMMISION, NEW DELHI FOR SPONSERING THE ENTIRE RESEARCH PROJECT.